At $50 per day, NRIs to bear own costs and campaign for Modi. Overseas Indians are being seen as Bharatiya Janata Party’s biggest donors. Since January, NRI in-boxes have been flooding with emails with a “rational and emotional message”. The “emotional” part pitched the BJP as valuing the Non-Resident Indian (NRI) and how the Pravasi Bharatiya Divas was started by the Atal Bihari Vajpayee government. 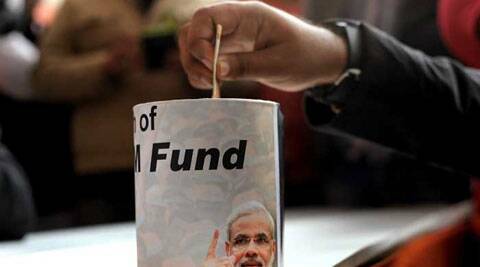 The “rational” email sought contribution to #Modi4PM Fund. Handling the BJP’s overseas donation campaign is a management professional Deepak Kanth, formerly based in London and now in Delhi, who sent out the emails. Last Sunday, The Overseas Friends of the BJP, Australia chapter, hosted a “Chai Pe Charcha with NaMo”, simultaneously in Sydney, Brisbane, Melbourne and Adelaide, in coordination with party convenor Vijay Jolly and co-convenor Rajni Shareen from New Delhi. The event saw over 800 participants including David Elliot, MP Baulkham Hills and Mark Taylor, Councillor Hillshire Council. Similarly, another Dubai-based Gujarati businessman Chetan Sonawala sent in his donation and kept the BJP cash registers ringing by keeping the email chain alive with his contacts in the UAE. As BJP’s online donation campaign gains momentum, NRIs from Gujarat are giving a major push to make the campaign a success. Patel and Sonawala are among 200-odd volunteers across different countries who are seeking donations from other NRIs on behalf of the BJP. Pankaj Patel, convenor of NRI campaign in Houston, said, “The NRIs will bear their own expenses for stay and travel. Professionals like teachers, nurses, and businessmen have saved up and will be in India for at least two months during the campaign for this election.” They estimate the cost of their campaign at $ 50 per day per person. Billboards saying “Bharat Bhagya vidhata… The world is waiting for you”, by the Houston group have already come up in Vadodara. A late starter in the online donation campaign when compared to the Aam Admi Party (AAP), BJP is now collecting an average Rs 15 lakh per day from its overseas supporters and has so far collected over Rs 4 crore, sources said.